Malala Yousafzai's first homecoming in six years was brief, and revealing. Brief, given the amount of time she would have otherwise liked to spend in Pakistan with friends from her early teens, whom she saw again after a shocking and long separation. One can easily imagine her longing to share with them stories of people she has met, things she has done, the world she has travelled and the international distinction she enjoys. Revealing, because, as a Dawn newspaper editorial on Friday underscored, Malala's story continues to illustrate "much of what bedevils this country, and the conflicted narrative that feeds its sense of perpetual victimhood". It was Malala's first homecoming since 9 October 2012 when a Taliban gunman shot her in the head. Since then she has been living in the UK. After recovering from her near-fatal injuries, Malala and her family relocated to Birmingham and she is now studying at Oxford. Her global fight to improve girls' literacy saw her become the youngest person ever to win the Nobel Peace Prize. The trip back to Pakistan came out of the blue. During an address at the Prime Minister House shortly after her arrival on Thursday, she said it was a "dream come true". But the secrecy that shrouded her movements, and a tight security cordon that controlled people's access to her - and possibly her access to people - couldn't have been a part of that dream. She expressed this sentiment to a neighbour in Mingora, the main town in Swat valley, where she used to live. "Uncle, I will come again next year, and will come without the security," she was quoted as telling Faridul Haq Haqqani, who spoke to BBC Urdu's Riffatullah Orakzai. Mr Haqqani was able to meet Malala because he lives in the house in Mingora where Malala's family lived until she was shot. The family - Malala, her father Ziauddin Yousafzai, her mother and two brothers - flew in a military helicopter to Mingora on Saturday. They were accompanied by federal minister Maryam Aurangzeb. The visit was just as unexpected as her arrival in Islamabad two days earlier. They spent just about two hours in the area, and visited only two places. Their first stop - their erstwhile home - was understandably their prime destination, and the visit turned into a deeply emotional event. "As soon as they stepped into the house, they broke into tears," Mr Haqqani said. "Ziauddin prostrated himself on the lawn of the house; he kissed the ground, then picked up the soil and rubbed it on his eyes [a thanks-giving gesture]. There was silence in the house that lasted several minutes." He said Malala and her mother, Topakai Yousafzai, repeatedly inquired about the neighbours and asked questions about how everyone was keeping and what they were doing. 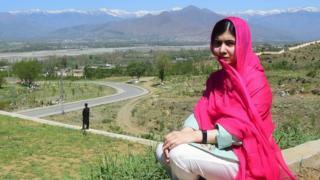 Malala then asked to meet her friends in the neighbourhood, whom officials brought over amid tight security. Has peace been restored to Swat Valley? Mr Haqqani said he had a long chat with Malala as she went with him from room to room, recalling how they had used each room when they lived there. "I could see that her thoughts had matured. She felt restrained by the presence of security, and promised she will come without security the next time." The only other place she visited in Mingora was a military-run cadet college where she met students and staff and wrote in the visitors' book. Some of her friends were also invited. This disappointed some social and political activists who had been looking forward to meeting her. Also disappointed were students of a women's college she helped build in her native district of Shangla, neighbouring Swat. But everyone quoted in the media said they understood her constraints, and that she continued to be a target of the Taliban. This appears to be an apt comment on the state of security in Pakistan. While many, including Malala herself, described her homecoming as a sign of better security in Pakistan, the limits placed on her movement and a tight lid kept on her itinerary show dangers remain. So too does the state-approved narrative that Pakistan is at the centre of international conspiracies hatched - as any apolitical Pakistani on the streets will tell you - by the Jews, the Crusaders and the Hindus. This was evident in a fierce social media campaign mounted by her opponents during her visit, repeatedly accusing her of being a decoy and an agent of the enemy powers, promoted to humiliate Pakistan. The state - and more particularly, the all-powerful security forces - have done nothing to change that narrative. And while the desire of the Yousafzais to visit Pakistan is understandable, who arranged this visit - the civilian government of Prime Minister Khaqan Abbasi or the military leadership - remains unclear. What is clear is that the family's entire security detail and logistics were provided exclusively by the military and its intelligence services. While this may be justifiable, sources told the BBC that the choice of her engagements showed a clear bias. They pointed out that while authorities discreetly alerted some groups of Malala's visit weeks in advance, some of her father's friends from his days of political activism and known for their anti-military views were kept in the dark. Some circles have pointed out that the military is keen to project a soft image of Pakistan as part of its efforts to reduce tensions with the US, which recently blocked military aid to Pakistan. They say arranging the visit for Malala, who's now heading back to the UK, may be part of these efforts. 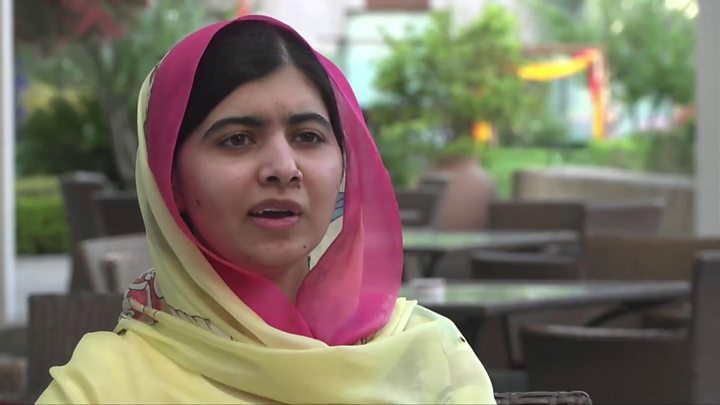 Media captionMalala Yousafzai: "My focus is only working for the good"